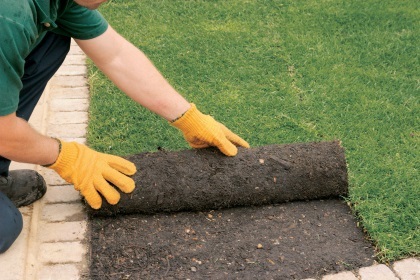 Sod installation is the perfect solution to fix that sparse looking lawn, that weedy lawn needing renewing or if you’re facing a barren backyard. Laying sod provided by the Yard Stop Garden Center is the easy way to an instant, lush lawn. Our professional landscape contractors are experts in testing your soil to determine the type of sod best suited for your specific environment and purpose. Remember that the type of sod type that worked for a friend of yours may not work for you. 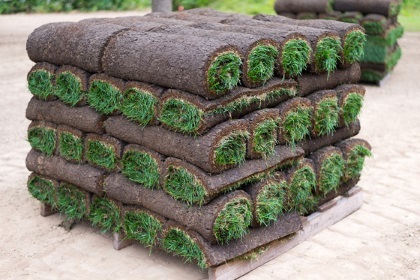 Whether you are a home builder, commercial developer or residential home owner the Yard Stop Garden Center can fulfill your sod installation needs. Looking to “Do It Yourself” (DIY) we deliver everything you need to get the job done. The single largest factor in the cost of your new sod installation or landscaping installation is the size of your property. If your house sits on a huge lot, and you’re not sure if you can afford to landscape the entire area, talk to one of our professional landscapers about the possibility of landscaping it in sections. 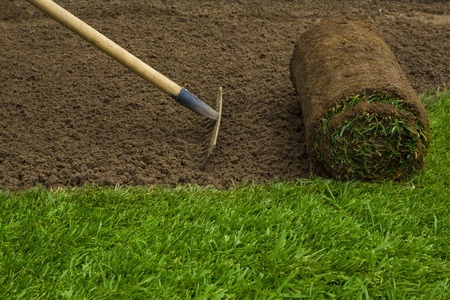 We will ensure proper testing of your soil to determine the best sod product. A wrong decision here can mean failure for your new lawn to grow properly. Measurements. Making sure you have enough sod to do the intended sodding project. Our experts look at the big picture. Killing and removal of all old grass. This may entail more than one treatment for effectiveness. Proper soil preparation and grading. The value of proper site preparation and soil improvement, before any planting takes place, is that it will be easier for the grass roots to penetrate deeply and evenly upon installation. It is now time for the Yard Stop Garden Center to deliver and lay your beautiful new sod. During sod installation, it is essential that turf be watered thoroughly. Soak upon installation and water as needed to keep your grass from drying out. Zoysia grass makes for a beautiful lawn or turf with a fine to medium textured leaf and the thick cushiony feel of lush carpet. Zoysiagrass actually requires less mowing, watering and little if any chemicals to survive making Zoysia grass a very eco-friendly grass. Zoysia grass grows differently than most other grass types. Rather than growing tall with seed heads, Zoysia grass spreads to form a dense sod by growing stolons or 'runners' thus expanding in multiple sideways directions rather than up! Argentine has wide broad leaves with a good darker green color, making it more suitable for Lawns in Florida and other Coastal Southern states. It is used extensively for lawns, because of its attractive look and the fact that it produces less "objectionable" seed heads than other Bahias. Best for use in full sun areas. The most common grass in Florida, Floratam is an easy to maintain St. Augustine that performs well throughout Florida. Floratam is a fast-growing, vigorous, dark green, broad-leafed St. Augustine grass. This improved variety of St Augustine grass is wear resistant and has good injury recovery. Cost estimate calculator — Please call us at (352) 357-9964 for a quote.